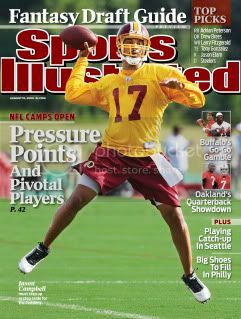 Coming to a newstand later this week (or your mailbox): The latest Sports Illustrated, featuring Washington Redskins quarterback Jason Campbell on the cover. So until we hear from Campbell later this afternoon, this gave me an excuse to dig in to the SI archive to see what other Redskins gems I could find. It’s the first time since Dec. 3, 2001 that the Redskins have had the SI cover to themselves. When Marty Schottenheimer’s club won five in a row after starting 0-5, SI had Chris Samuels and Stephen Davis leading the way out front. Before then? - “Let ‘er Rip,” with Mark Rypien and the Super Bowl XXVI champs graced the Feb. 3, 1992 cover. 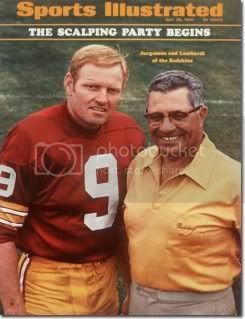 And before that, we’re into the Redskins’ glory days, as they were, with a few Theismanns, a Dexter, a couple Riggos, even Calvin Hill and Vince Lombardi. All told: This is the 22nd time the Redskins have been the focus of the SI cover, counting losses to the Raiders in the Super Bowl, to the Dolphins in 1984 and to the Giants in 1986. - Steve Young running over Charles Mann on the Jan. 18, 1993 cover.